The KT100 Juicer is a new design of single auger machine offering a class leading feed tube and production rate. It features a neat self cleaning device that wipes the inside of the barrel and the outside of the juicing screen. This is a super precise high performance juicer for the committed juice fan or even for light commercial work. If you have always looked at juicing with a bit of envy, but can see the benefits of juicing fruit and veg every day, then this masticating juicer then look no further as this is the juicer for you. 1) Flexibility and Speed: This juicer will juice all soft and hard fruits, vegetables and leafy greens. The KT100 has a class leading feed tube size and production rate. We can honestly say that this machine is as quick to use as a centrifugal juicer while giving great efficiency and cold pressed juice. If someone likes juicing but is frustrated by their centrifugal juicer and is put off by the small feed tube on other cold press machines then this is their best choice. It is also the ONLY juicer of its type to work WITH gravity if the fruit and veg fall in, they will get juiced! No pushing needed! 2) Durability: these machines have huge life spans, with no blade or cutter there is nothing to go blunt and with the reduction gearboxes giving them their low speed operation the high quality motor will last and last. 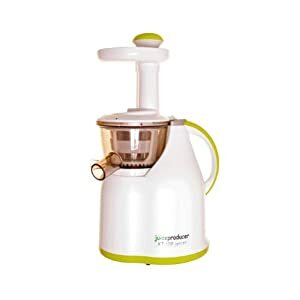 3) The cold pressed advantage: This type of juicer is more expensive than centrifugal juicers (whizzy basket juicers) but they deliver many advantages. The juice they make is cold pressed, has better nutritional properties and can be stored. They also juice all fruits, vegetables and leafy greens such as wheatgrass. You can even peel oranges and feed them through the KT100 negating the need for a citrus juicer. Centrifugal juicers make an oxygenated juice, due to the juice flying around in the machine in droplet form. This is no good for nutrient retention. Stylish, quiet and fast, the KT100 Juicer is a brilliant machine. Its hard to believe that something so small is so powerful. The Waring Pro Classic Blender is a work of art, Its waterfall style base and clover leaf patent glass jug will gently swirl the contents of the blender and helps to keep mess to a minimum. 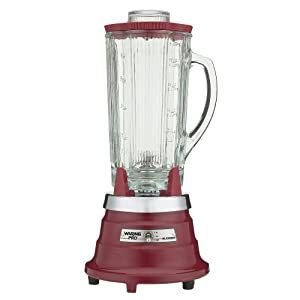 The powerful but quiet motor makes the blender very quiet and a pleasure to use, to the point where you can carry on a conversation without the need for ear plugs. The motor is man enough for all blending requirements and whips up the smoothest results time after time. The blender is fantastic for cocktails, smoothies and soups, it will even make light work of crushing ice. Its easy to clean, simply fill the glass jug with warm soapy water and place it back onto the blender and turn it on for a few seconds and it will almost clean itself. The machine has 2 speed settings which are more than enough for such an efficient machine. You should not have problems controlling the texture of whatever you are blending. The blender demands pride of place in the kitchen as its expensive retro look and feel is stunning. The Waring Pro Classic Blender is available in the following colors Polished or Brushed Chrome, Chilli Red, Retro Green and Ebony Black. Self-cleaning blade assembly, this blender cleans up after itself! 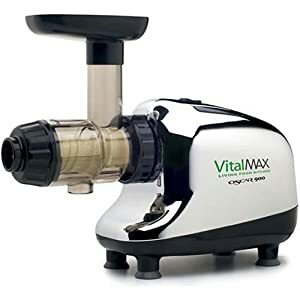 The Oscar Vital Max is the best quality single-augur multi-purpose juicer/food processor on the market today The powerful 200w motor is quiet and the gearbox causes little vibration and both come with a 20 year warranty. This is very well made and robust juicer and is built to last. It will make light work of juicing fruit & Veg The juicer is a masticating model which will produce more juice than a Centifugal Juice and will also produce juice that will retain more vitamins and minerals. This is because the centrifugal models grate the fruit/veg and spin the pulp to extract the juice however a masticating juicer crushes the fruit. The down side to this model is that the shute is very narrow so everything has to be cut up really small to fit down it. It is pricey but if you drink a lot of juice, which you will when you have tasted the superb quality it producess, then it will quickly pay for itself. So what makes the VitalMax so special? Unlike Oscar living juicers and other Cold Press Juicers, conventional juicers destroy many of the enzymes, vitamins and nutrients in any foods processed. The VitalMax Juicer uses a crushing and squeezing action, similar to cold pressing, that doesn't destroy the enzymes through heating. Because it also squeezes just about every last drop of moisture out of fresh produce, the VitalMax is economical and reduces wastage. The Oscar Vitalmax Juicer comes in three models Chrome, Black & White. If you are serious about juicing then this machine is perfect! See our list of the top 10 best juicers!